We’re less than six months away from the December 16 release of Rogue One: A Star Wars Story. In terms of the original Star Wars, that means the media landscape is suddenly the Rebel jungle base on Yavin IV, and the massive Lucasfilm hype machine has just rounded the planet in order to fire its moon-shattering promotional onslaught on our world. 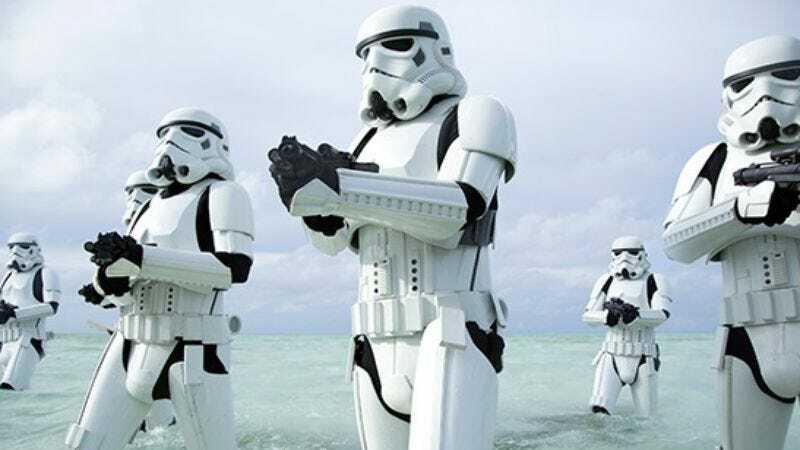 One of the first salvos in the fight for survival and/or pop culture attention came today, with Entertainment Weekly showing off 16 new photos from the set, including several character profiles and some shots of Stormtroopers playing in the surf like the galaxy’s least relaxed beachcombers. The photos show off poses from Felicity Jones’ heroic spy, Jyn Erso, as well as detailing her character’s motivation for joining the Rebellion. (It involves her dad, played by Mads Mikkelsen, who’s some sort of highly sought-after scientist.) We also get some insight into Ben Mendelsohn’s hot-tempered cape-wearer Orson Krennic, who’s apparently an Imperial middle-manager, desperate to avoid the Empire’s standard “Darth Vader uses magic to choke you” severance package. Plus, we get closer looks at most of Erso’s motley crew of soldiers and battle station blueprint thieves, including Donnie Yen’s Force-worshiping blind warrior monk, Forest Whitaker’s grizzled soldier, and the brusquely comedic new droid being played by Firefly’s Alan Tudyk. As previously alluded, there are also a number of shots of a new, as-yet unnamed planet, located deep within the Jimmy Buffet sector of a galaxy far, far away. According to director Gareth Edwards, the sun-soaked setting—complete with gun-toting Imperial soldiers splashing around in the surf— is meant to evoke images of the Pacific theater of World War II, where heated battles sometimes ocurred in idyllic tropical locales. It’s not the first time Edwards and Lucasfilm head Kathleen Kennedy have called Rogue One a war film, either. They made similar assertions earlier this week, when they challenged the idea that the film’s recent slate of reshoots were intended to lighten its dark and military tone. You can see all 16 new pictures—along with descriptions of the characters played by Diego Luna, Riz Ahmed, and Jiang Wen—over at Entertainment Weekly’s site.